The Corey Dennison Band has been around since 2013. Dennison, a Tennessee native, fell under the spell of the blues at a young age, listening to the music on late night radio. He started playing guitar at age six, trying to imitate the music of blues giants Gatemouth Brown, Albert Collins, and Albert King. He also was drawn to soulful vocalists like Wilson Pickett, Curtis Mayfield, and Sam Cooke. He formed his own band after serving a 12-year stint in Carl Weathersby’s band as rhythm and lead guitarist, releasing a live disc in 2013, but recently issued his self-titled debut studio release on Delmark Records. Dennison learned his lessons well, because this is a bracing piece of work, with deep roots in soul, blues, and southern rock. Dennison is a versatile guitarist and can bring it vocally as well, rivaling some of his musical idols in some cases. He’s joined by former Nick Moss sideman Gerry Hundt, who plays lead and rhythm guitar and keyboards, drummer Joel Baer, and bassist Nik Skilnik. Dennison and Hundt collaborated on 11 of the 13 tracks. “Getcha’ Pull” is an amusing southern rock-fueled tribute to Dennison’s grandmother’s homemade elixir, while “Tugboat Blues” is just good old Chicago electric blues. The driving R&B track “The Deacon,” written by Hundt, has a funky and relentless groove, and “Room To Breathe” is a smooth, slow burning slice of deep soul with a heartfelt vocal from Dennison. “City Lights” mixes blues and funk with a crisp guitar break, and “She’s No Good” is a sharp country rocker. 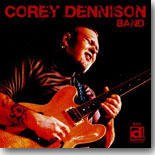 As good as Corey Dennison Band is as a blues recording, it’s equally or more effective as a soul recording. The mix of the two genres is just perfect on this album. Dennison is an excellent guitarist, but his vocals really set him apart. He moves from silky smooth to gritty and greasy with ease, with just the right amount of fire and passion. I strongly recommend this release to anyone who likes a healthy dose of soul and funk in their blues.